Each month as part of this series from the AAS Historical Astronomy Division, an important discovery or memorable event in the history of astronomy will be highlighted. This month, we focus on African American astronomer Benjamin Banneker. 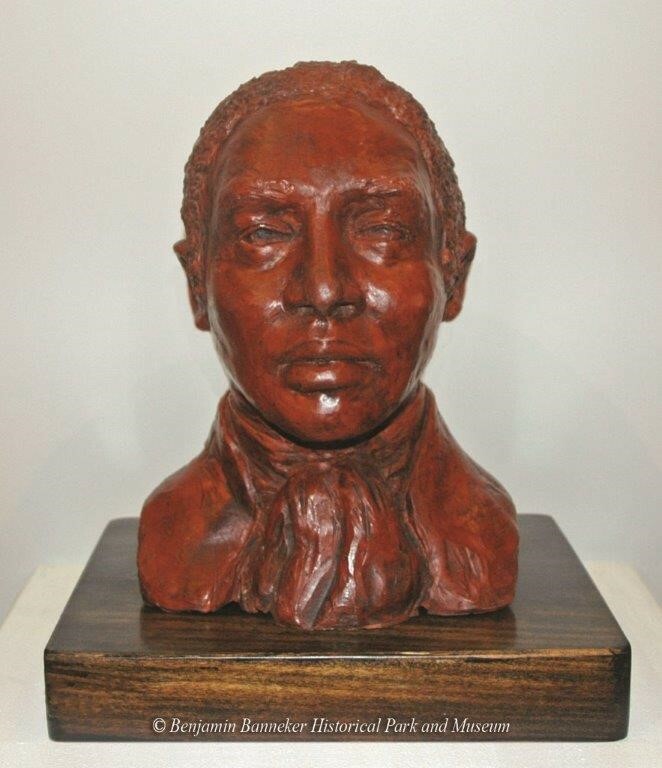 Benjamin Banneker (1731–1806) was born in Baltimore County, Maryland, to free parents. His family owned a 100-acre tobacco farm in Oella, Maryland. Banneker inherited the farm and worked the land for most of his life. He was a keen observer of nature and was one of the first scientists to note the 17-year cycle for cicadas. He received little, if any, official schooling, though he may have attended a local Quaker school during times of no harvest. Mostly self-taught, he learned mathematics and astronomy from books borrowed from neighbors; the Ellicott family for whom Ellicott City, Maryland, is named were the most supportive. He was enchanted by mathematics and enjoyed creating math puzzles. Also in love with the sky, he would observe the stars using a borrowed telescope. Fascinated by mechanical objects, he built a clock when he was 22 years old. He did not have access to metal, so he constructed the timepiece entirely out of wood. It became a local tourist attraction — people would visit him in his log cabin to see the clock strike the hours. Banneker also taught himself to forecast eclipses. He tested his method by comparing his calculations with those of James Ferguson — an early 18th-century writer of astronomy books — for the eclipse of 3 April 1791. Banneker's calculations showed that Ferguson had the time about 32 minutes early. In 1791 George Washington put Andrew Ellicott in charge of surveying the new Federal District (now Washington, DC). The District was to be 10 miles on each side, or 100 square miles. The team placed boundary stones every mile around the border and had to determine the latitude and longitude of each boundary stone. Ellicott hired Banneker to handle the astronomical needs of the survey team. Banneker started in February and worked on the project for about four months. Banneker used measurements of astronomical sources to determine positions, for which he needed to maintain an accurate clock. For local time he could measure the maximum altitude of the Sun, which would give local noon. For 0° longitude he used Greenwich, England. (Ultimately, once the Federal District was properly surveyed, Ellicott's team would set the 0° longitude line to run through the center of the US Capitol building. It was not until 1884 that Greenwich became the international standard for the Prime Meridian.) To get Greenwich Mean Time (GMT) Banneker used the "celestial clock" provided by eclipses of Jupiter's Galilean moons. The Nautical Almanac published annually by His Majesty’s Nautical Almanac Office (Britain) listed the GMT for these events. By observing the local time of an eclipse of a Galilean moon and comparing it with the GMT listed in the Nautical Almanac, Banneker could convert the time difference into a longitude difference. Almanacs were not new to Banneker, and in fact he created his own, the first of which was published in 1792. They were immediate best sellers. Banneker’s six almanacs, published annually between 1792 and 1797, were an exceptional achievement that required a thorough knowledge of complex mathematics, including spherical trigonometry, as well as tedious and complicated computations by hand. So, our early African American scientist was an accomplished man: surveyor, mathematician, astronomer, farmer, and naturalist. “The Life of Benjamin Banneker” by Silvio A. Bedini, Revised and Expanded Edition. Baltimore; Maryland Historical Society, 1999.